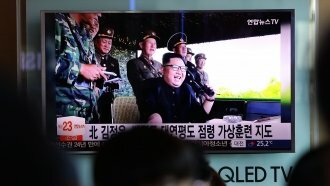 The trip comes as officials are reportedly preparing for a proposed meeting between U.S. President Donald Trump and North Korean leader Kim Jong-un. North Korea's foreign minister is visiting Sweden on Thursday. According to the Swedish government, Ri Yong-ho is meeting his counterpart, Sweden's Minister for Foreign Affairs Margot Wallström. The two are set to talk about the security situation on the Korean Peninsula as well as "Sweden's consular responsibilities as a protecting power for the United States, Canada and Australia." This isn't entirely out of place since the Swedish Embassy in North Korea represents U.S. interests in the country. Related Story What Other Americans Have Met With North Korean Leaders? Not explicitly mentioned on the agenda is the possible meetup between U.S. President Donald Trump and North Korean leader Kim Jong-un. Sweden's capital has been floated as a potential site for that meeting. North Korea hasn't officially commented since Trump accepted the offer to talk face-to-face.